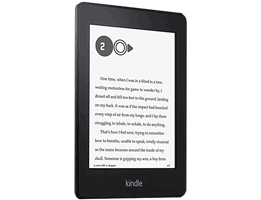 The Kindle Paperweight is a 6-inch, high-resolution e-book reader that offers a glare-free screen, a built-in night-light, a 212 ppi resolution and onboard storage space for 1,000 books. It weighs only 7.3 ounces and measures 6.7 by 4.6 by 0.36 inches. Plus, it utilizes a rechargeable battery. This gives it the awesome portability you need without having to worry about where you'll need to plug in. 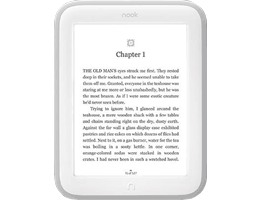 The Nook Glowlight is a beautiful e-book reader that contains a 6" infrared touchscreen display which supports a very clear and easy-to-read 758 by 1024 pixel resolution. It offers wireless connectivity, social media sharing, fast page turns and a bevy of added features. You can highlight your favorite passages, take sidebar notes and even browse the Internet. Furthermore, the Glowlight weighs only 6.2 ounces, making it one of the lightest e-book readers in the market! 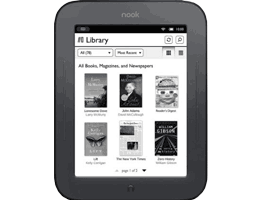 The Nook Simple Touch GlowLight is a 6" anti-glare touchscreen e-book reader that offers wireless connectivity. It can be used anywhere courtesy of its rechargeable battery, which takes about 3-1/2 hours to charge. Given one full charge, however, it can last an entire month with back-lighting and two months without any back-lighting. The Simple Touch GlowLight utilizes an integrated ‘GlowLight’ that makes it possible to read anywhere. 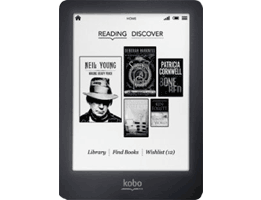 The Kobo Glo is a top-of-the-line grayscale e-book reader from the well-respected Kobo brand. It houses a large 6-inch XGA touchscreen display that’s both fingerprint-resistant and glare-free. It also contains an ultra-fast 1 GHz processor. This mean you can turn one page, two pages, three pages, etc. at any pace without ever having to worry about encountering a smidgen of lag. 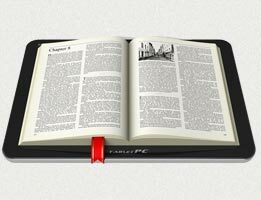 It’s also the only e-reader on the market that tracks your reading stats and lets you store your favorite passages. The Kindle is a lightweight, budget-friendly eBook reader designed for reading books while waiting for the bus, lounging in a doctor's office or lying in bed. It holds a whopping 1,400 books and can connect to all WiFi hotspots, modems and routers. Plus, it weighs under 6 ounces, making it lighter than your average paperback. Its most important feature is the large 6-inch gray-scale display that's designed so that anybody (regardless of age, gender or eyesight) can partake in some portable reading. What is an eBook Reader Device? eBook readers are handy devices for people who want to read books on the go. They’re especially helpful if you want to “pack” more than one title with you. For example, you don’t have to worry about picking and choosing because, with an eBook reader, you can take them all with you wherever you go. 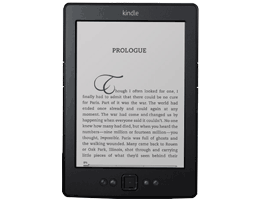 Yet while the eBook reader you own probably functions great as a way to read your favorite titles, there are plenty of other functions that you might not be aware of that you’re not utilizing. Knowing what an eBook reader can and cannot do is a great way to do shop comparisons. Making the decision based on what your needs are will ensure that your eBook is the right fit for you. 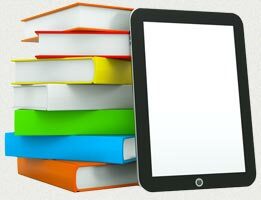 There are different aspects about what goes into your eBook reader when it comes to the technology it handles. The first question you want to ask yourself is whether you will be able to purchase the books you want to read on your eBook reader or not. Not every title is available on your eBook reader — if you have language or country limitations, for example, it can restrict what you can or can’t download, and from where. You also want to make sure your eBook reader can download “open” and “proprietary” formats. Open formats are available on most eBook readers, whereas proprietary formats usually mean you have to attain additional software before you can begin reading. You’ll want your eBook reader to be able to switch seamlessly between these types of formats if you want to read titles available on either one. You’ll also want to be sure that your eBook can bookmark pages as you switch from open to proprietary, and vice versa. How large or small your eBook reader is, what size of the screen, and how thick the device itself is will all depend on what your specific needs and preferences are for your eBook reader. Different people like different things. For example, some people prefer a larger eBook because it means a larger screen size, which can reduce the number of page turns/swipes you have to make to read a book. Others prefer a smaller eBook reader because it’s more compact and thus easier to hold and travel with. The thickness of the eBook reader also depends on what you like — a heavier, more durable reader, or a lighter, easy to pack one.